�����Optimism is quite high after a very successful FUN Show. Dealers reported a decent combination of buying and selling throughout the show for a variety of series. The only negative coming out of Florida was that modern collector coins are somewhat soft. Coins dated after the 1940's have seen a downturn in collector activity and discounts are required to move many of the coins in Lincoln Cents through Presidential Dollars. The exception may be the ultimate grades with very low populations. �����Silver Dollars remain very robust in all grades. Many dealers have current programs in play and supplies are dwindling. MS63 through MS65 coins are easy sellers at current levels and appear to be headed higher. U.S. Gold and all the Modern bullion coins are also in favor. Even with the metals falling last week, demand was positive as buyers took advantage of these lower levels. Most dealers expect that metals will remain the focus of collectors and investors during the year and prices will move higher. If this is the case, higher metals will create added impetus for the entire coin market. �����In this week's LD Wholesale Market Dealer Price Guide many of the adjusted Market prices are results from the FUN Show. Aside from the dealer information gathered, the Heritage Auction provided new data, yet more results are still to come. There were several Proof Half Cents and Large Cents that provided advances like the 1834 Half Cent in PR65 Brown, now up to $6,650 and the 1836 in PR64 Brown moving to a higher $7,475. The 1848 Large Cent in PR64 Brown is higher at $8,475. Indian and Lincoln Cents also have been very active, especially in high grades. 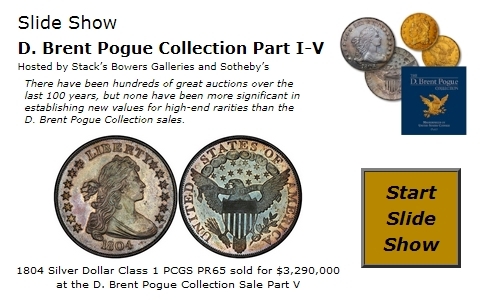 Many buyers are looking for coins that have extra eye appeal such as the new + designation or CAC coins.